We create a collection of products with a sense of coolness to provide precious breathing space for people who have busy work life in cities around the world. 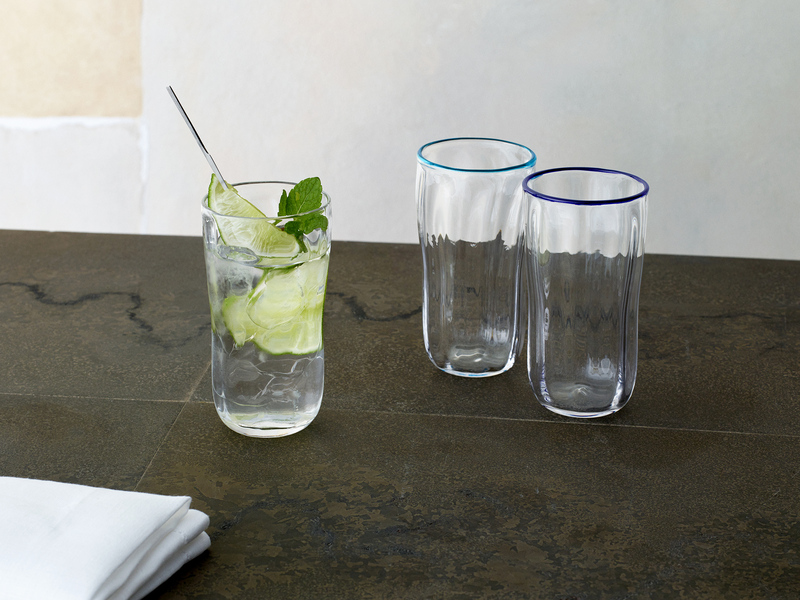 Vidro glass tumbler from Hizen (Saga Prefecture). 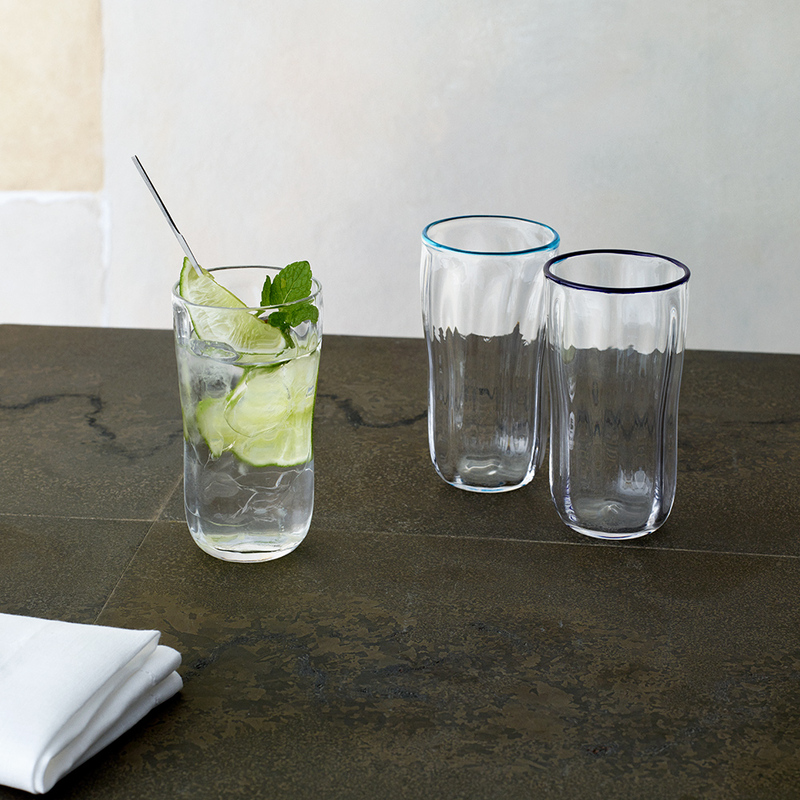 A handblown glass with uniqueness breathed into each piece results in a soft texture that is comfortable to the touch. 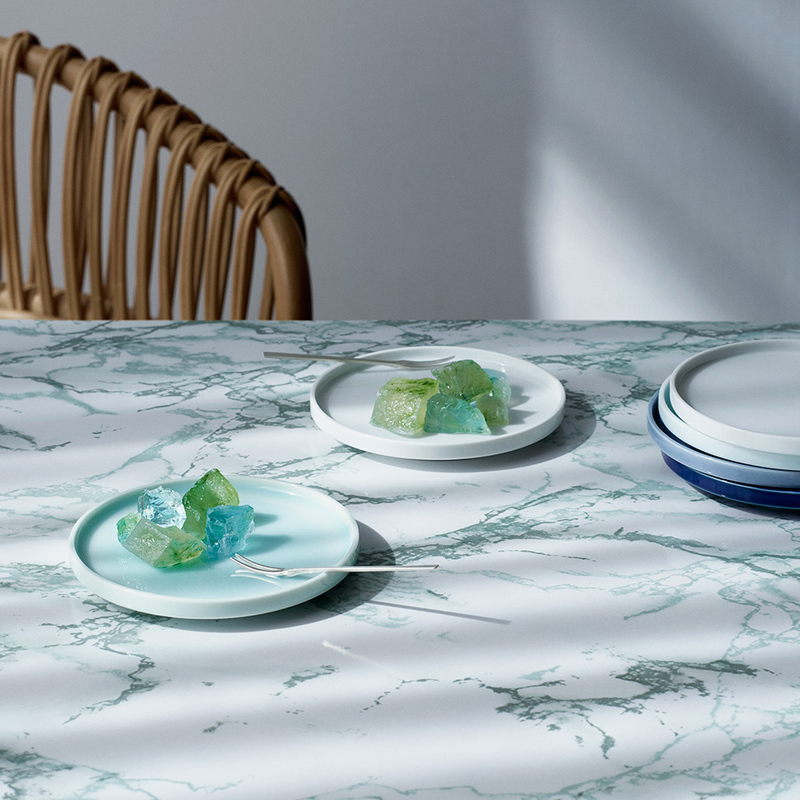 The pattern created by its wave-like rolling shape is beautifully expressed when light passes through it. 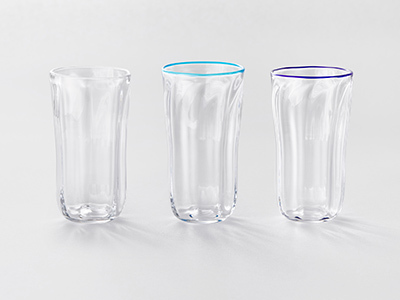 Made by Soejima Glassware Co., Ltd.
Soejima Glassware Co., Ltd. is a manufacturer of “Hizen Vidro” established in 1903. 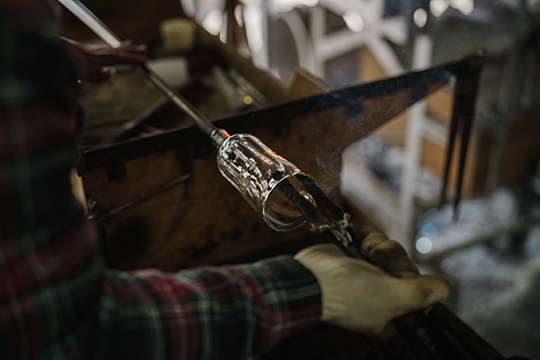 “Hizen Vidro” is a glass craft that is designated as an important intangible cultural heritage of Saga City. 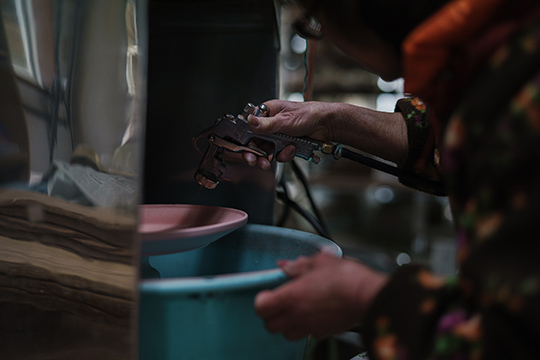 As a successor of this technique which originated from a laboratory in the Saga domain at the end of the Edo period, this company excels in free-blown glass without using any mould and produces a wide range of glassware such as tableware for daily use and artworks. Small porcelain plate from Arita in Saga Prefecture. 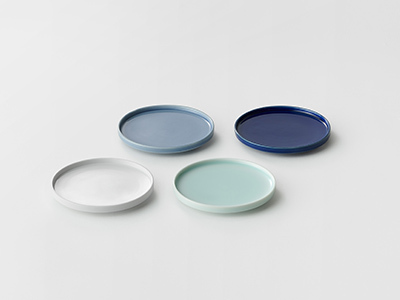 This collection of small plates consists of four colours glazed in beautiful hues. 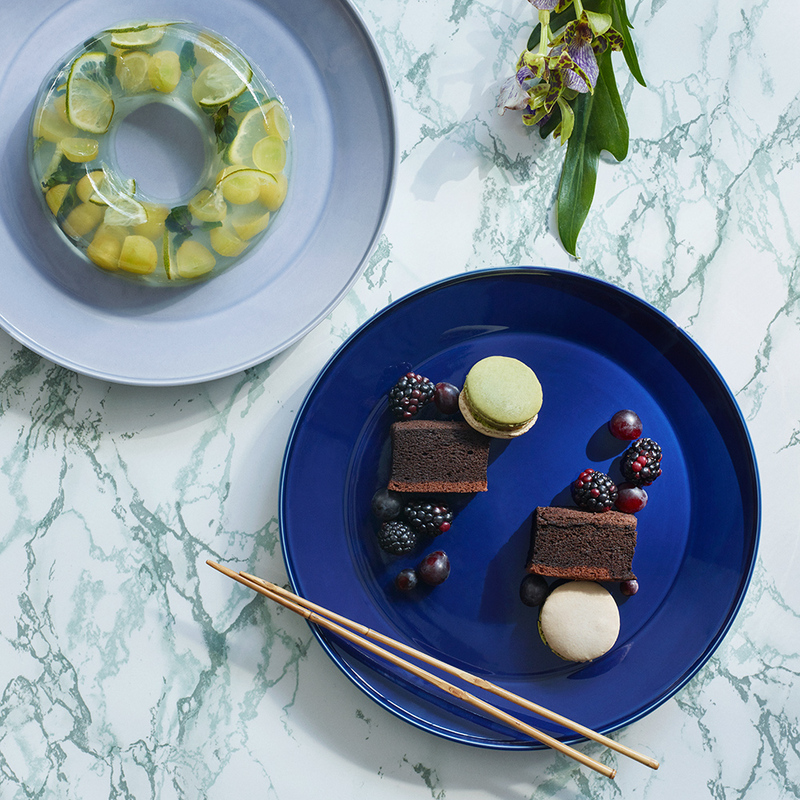 Designed in a size that is suitable to be handheld, they are used mainly as dessert plates and serving plates. 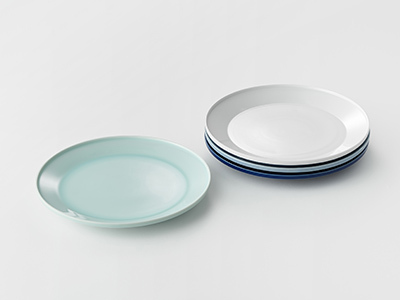 Use them together with Plate L to create a well-coordinated and pleasant table setting. 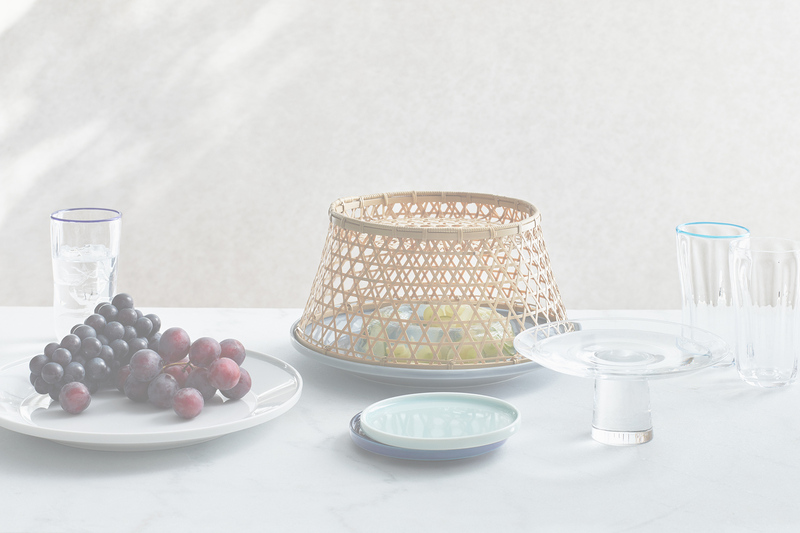 Made by Fujimaki Ceramics Co., Ltd.
Fujimaki Ceramics Co., Ltd. is a pottery founded in 1775 in Arita, the birthplace of porcelain making in Japan. During the Edo period, they produced large plates and large pots painted in “Sometsuke” style (blue and white painting). Subsequently, they started production of white porcelain and celadon from 1903. 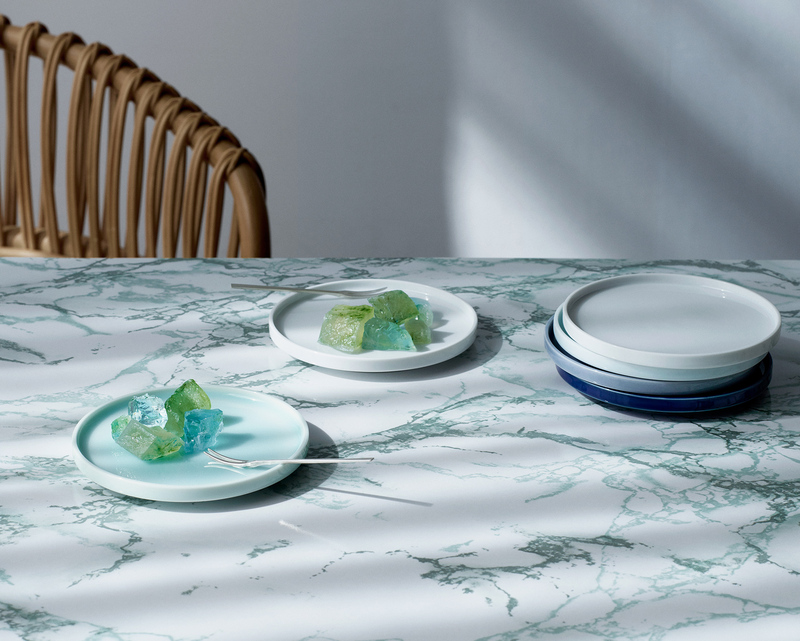 Now, under the theme of “Refreshing - Blueness - Inspiration”, they produce porcelain of refreshing colors, making full use of their glazes such as white, pale blue or crystal glaze. Large porcelain plate from Arita in Saga Prefecture. 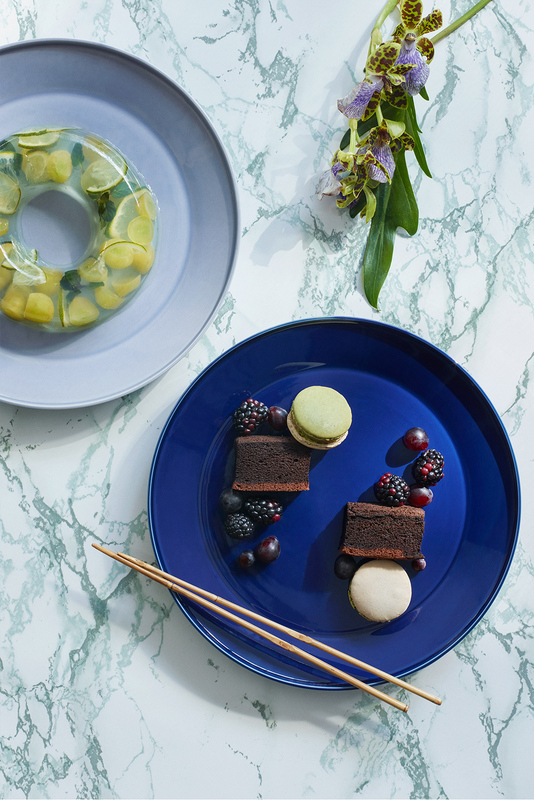 Its refreshing colours such as the signature pale blue glaze and clean contemporary shape fit all kinds of food from main dishes to desserts. 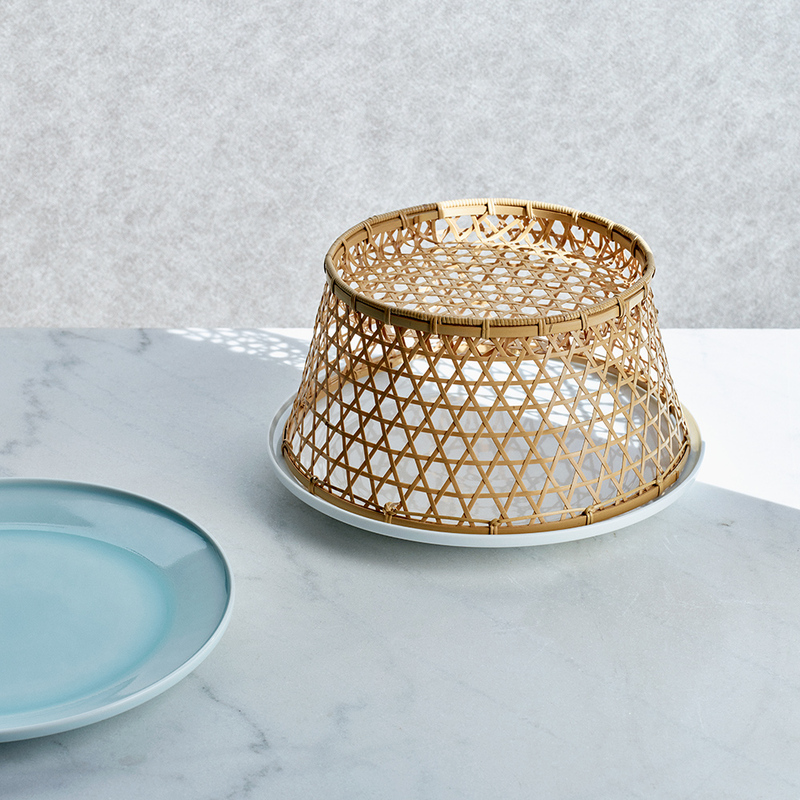 Combined with the Bamboo basket in the same collection, it can be used as a plate with a lid or a plate on a stand and gives a decorative accent to your table setting. through it. 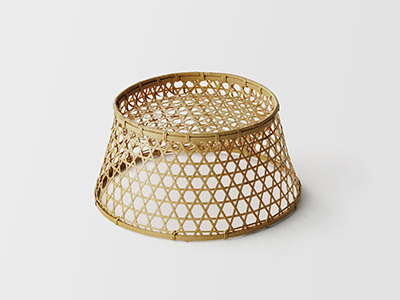 Bamboo basketry from Kyoto. 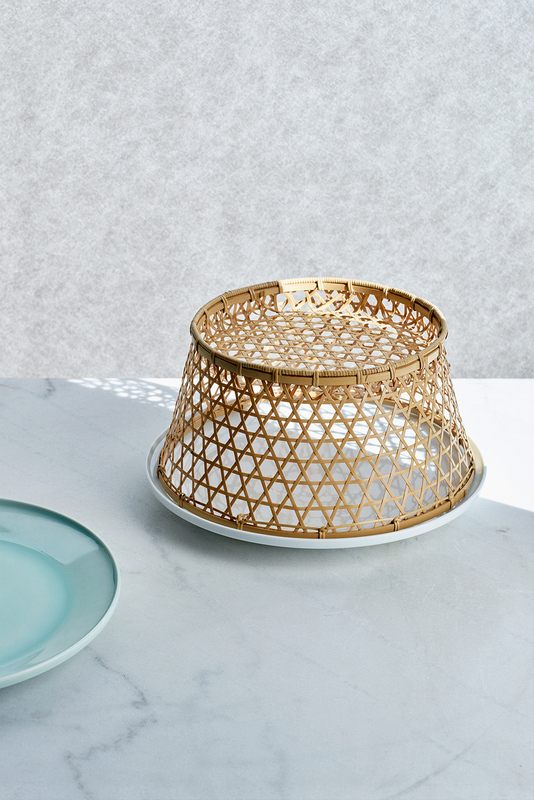 When used with Plate L, this basket functions as a lid or a stand for the large plate. 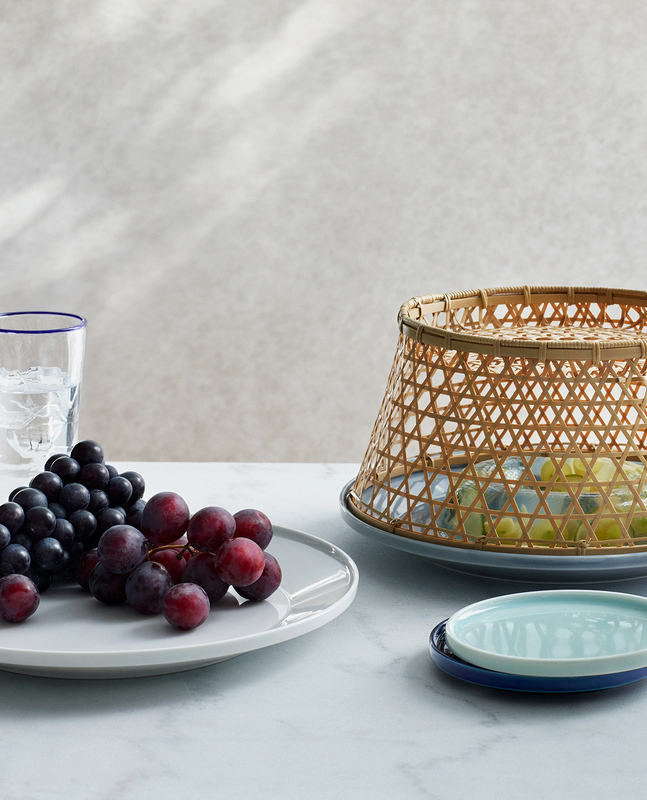 Made of high-quality Japanese madake bamboo grown in Kyoto, the cleanliness of the material and the shadows cast by the delicately woven pattern of bamboo bring a fresh breeze to your table. Takemata Nakagawa Takezaiten is a supplier of bamboo founded in 1688. 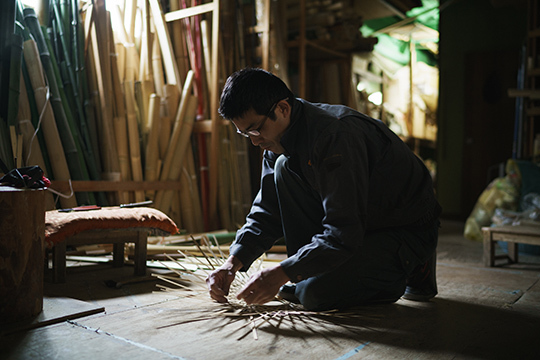 They offer various services related to the bamboo materials, from primary processing of “Kyo-meichiku” (Kyoto bamboo), which is used for buildings in Kyoto or crafts such as Japanese tea ceremony utensils, to construction of bamboo fences in Japanese garden and temples. 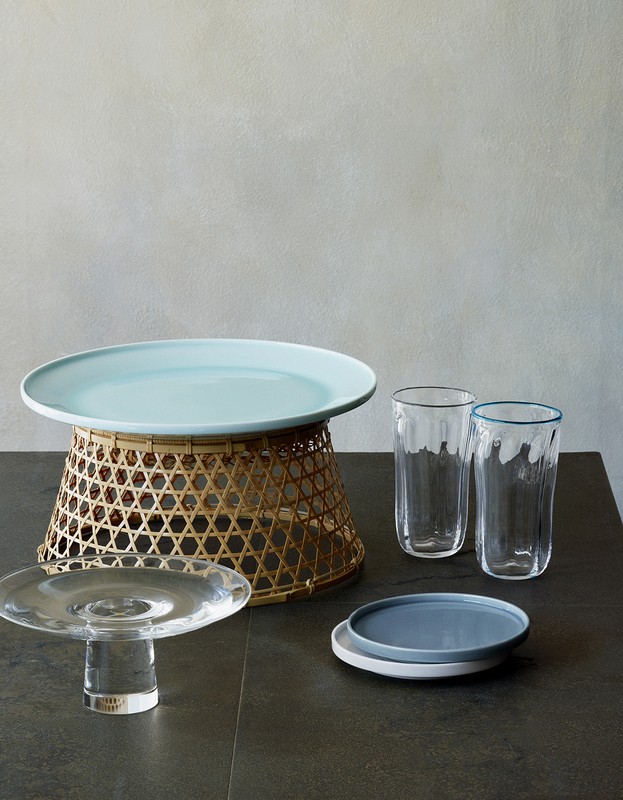 The company is able to handle all the processes for these works in-house and produces bamboo ware that is suitable for a contemporary lifestyle. 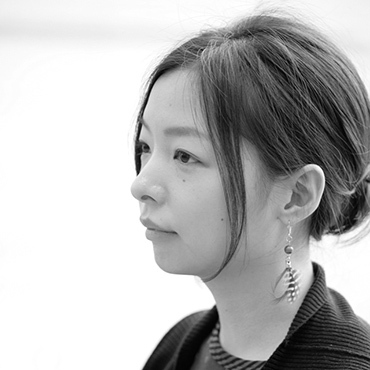 Creative Director & Designer, Shizuka Tatsuno Studio Inc.
After studying design in London, Shizuka gained experience in the field and established her design office. With a focus on designing furniture, interior and fashion accessories, she provides various services in planning, direction and graphic designs among other areas.